OFFALY ensured Kevin Martin’s maiden League game as manager was a happy occasion, winning a first League game in Croke Park since 1991 by beating Dublin by 2-25 to 1-15. Rated 5/1 outsiders with bookmakers before throw-in, Offaly were by far the better team and ensured Pat Gilroy left Croke Park after his own managerial League debut with the Dublin hurlers with plenty to consider. Gilroy named a team featuring eight League debutants. Offaly meanwhile, formed a far more experienced outfit. Joe Bergin, Dan Currams and Oisín Kelly all scored early on as Offaly consistently found space around the middle of the pitch, while Faithful midfielder Shane Kinsella was the most impressive individual performer of the half, scoring three long-range points. Dublin dropped one of their debutants, Cian McBride, into a sweeping role between their two defensive lines, with another, Ronan Smith, mostly operating at midfield. The knock-out affect however, meant Dublin’s inside forward line were outnumbered and Offaly’s long-range score taking negated the extra defender at the other end of the pitch. Indeed only for Dublin’s 25th minute goal, they could have been out of the game by half-time. Shane Barrett, who of the few players with significant senior Championship experience, made a burst from wing-back along the Cusack Stand end line and fed Paul Winters. The St. Brigid’s man fired past Conor Slevin but Dublin scored just two more points in the half to Offaly’s six, a run that left the score line at 0-16 to 1-8 at the break. 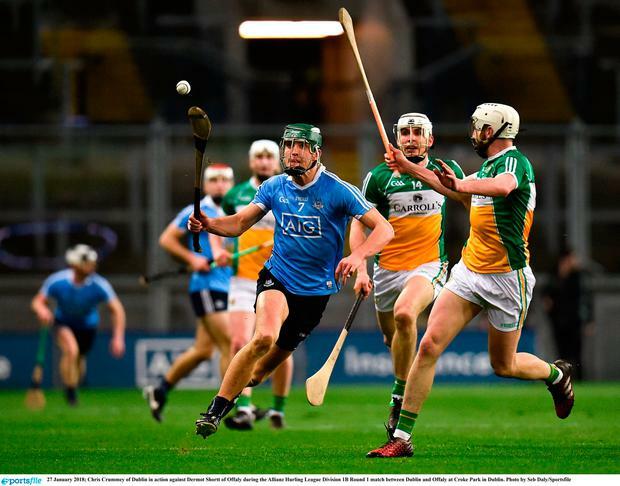 Dublin started the second well, with Eamonn Dillon scoring a point with his first touch but Shane Dooley – on as a sub at half-time for Bergin – replied with a free and then converted a penalty to stretch Offaly’s advantage to seven. Conor Mahon ambled through the centre of the Dublin defence and before he had a chance to pull the trigger, Bill O’Carroll hauled him down. Dooley’s penalty was so sweetly struck, Nolan never even moved. The only other significant moment for Dublin was a return for Conal Keaney for his first appearance in blue since July 2015. Otherwise, the result effectively ended any chance Gilroy’s new troops had of being promoted to Division 1A while any relegation fears Offaly might have had have before the start of the competition were ended with their first Croke Park victory since 2005. SCORERS – Offaly: S Dooley 1-5 (1-0 pen, 5f), J Bergin 0-6 (4f, 1 ’65), L Langton 1-0, O Kelly (1 sideline), S Kinsella, C Egan 0-3 each, D Egan, D Currams 0-2 each, D Shortt 0-1. Dublin: D Burke 0-6 (5f). Dublin: P Winters 1-1, A Moore 0-2, F Whitely, R Smith, N McMorrow, E Dillon, J Hetherton 0-1 each.